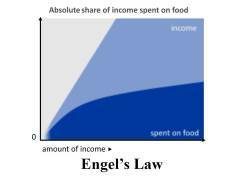 Quick Definition: Engel’s Law states that the proportion of spending on food decreases as incomes rise. 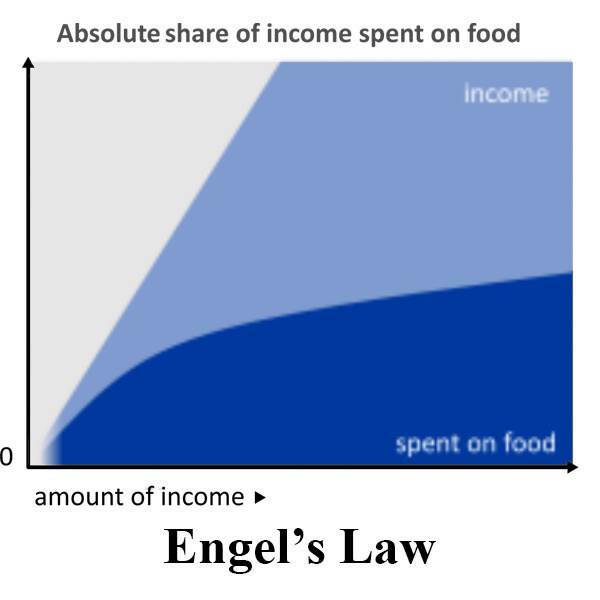 Engel’s Law is named after the statistician Ernst Engel, who was the first to investigate the relationship between income and spending on food in 1857. The law states that as income rises, the proportion of income that is spent on food decreases. This proportion, also called the Engel’s Coefficient, means that consumers increase their spending on food by a smaller amount than the increase in income. For example, a household which sees their income double is unlikely to double their spending on food. The law implies that poor households spend a greater proportion of their income on food than higher-income households. When the costs of food increase, it will hit the poorest the hardest. This is because they already spent a large proportion of their income on food so when food prices increase further, they may not be able to feed themselves adequately. below 30 percent, represents a wealthy life. Income – This is the money people earn from wages, dividends and rents.